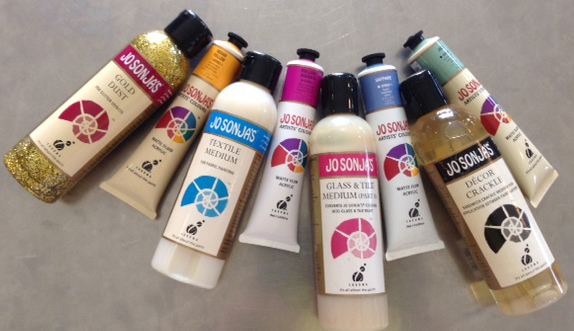 All in all, we stock 15 ranges in acrylics and we think they all answer a different need!! Atelier : Free Flow in 36 colours available in 60ml and 500ml bottles, Atelier : Interactive in 77 colours available in 80ml tubes, Chroma : Jo Sonja craft colours in 80 colours available in 75ml tubes, Golden : Heavy Body in 59ml tubes / Fluids and High Flow in 30ml and 118ml bottles / Open in 59ml tubes, Jacquard’s Lumiere light body metallic acrylics in 70ml jars, Lefranc Bourgeois’ Flashe: in 125 and 400ml jars (plus some colours in 750ml), Matisse : Heavy body in 75ml tubes, 250ml jars and 500ml jars (all colours in the 3 sizes), Pébéo : Studio acrylics in 100ml and 250ml tubes and some kid quality sets and 1 or 2 litre bottles (brands vary). ATELIER‘s Free Flow (36 colours available in 60ml BB and 500ml bottles BB/BA/M). Despite already having Golden’s Fluids on offer, Atelier’s Free Flow seems to add a little je ne sais quoi that could make it also a good tool. Their slogan is that the paint just flies off the brush and, well, yes and no. I find them not as fluid as Golden’s ones when poured. They tend to blob more. But when hit by water, then yes they do fly… more like ink than a paint! The fact that it needs so little to get them going, means colours remain strong and vivid and they dry to a velvety, mat finish. The price is pretty attractive too! ATELIER‘s Interactive BB/BA 77 colours in 80ml tubes. Atelier Interactive is a professional acrylic with a satin sheen that can be used straight from the tube or with traditional acrylic painting mediums. The reason we have added this paint to our ranges is that it can be sprayed with water to work longer sessions and, with the help of the Unlocking Formula, you can even reopen the paint after it is fully dry as well a blend and extend wet-in-wet blending sessions for as long as you like. CHROMA Jo Sonja’s Decorative Painting System BB/BA/M (80 colours available in 75ml tubes) Developed as a result of collaboration between paint company, Chroma, and renowned American Folk Artist, Jo Sonja, these paints and mediums are a professional quality paint specifically created for decorative art. These have the added bonus of being lightfast and permanent which not many craft paints are. Roughly they produce 4 types of acrylic paint which give you 4 different “feels”. 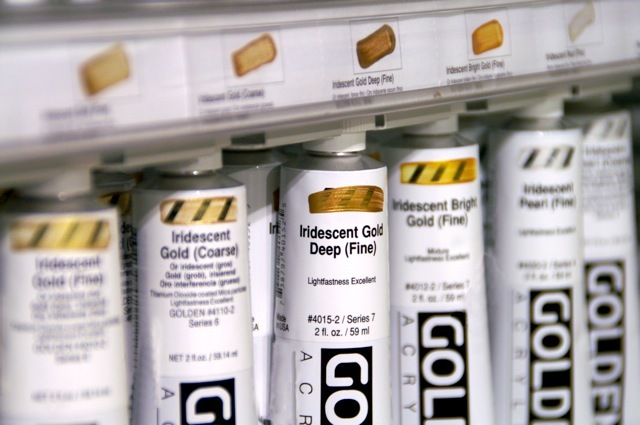 They can all be mixed (in the case of the Open range you’ll simply lose some of the time it stays workable) and you can control virtually all aspects of your paint – thickness, transparency, drying time, gloss – thanks to a plethora of gels, mediums and moulding pastes… exciting? welcome to the wonderful world of plastic! We regularly offer some “Golden Nuggets” free demo classes in the centre in which you can test all their amazing range of products… If you have an interest in knowing about the next one, please contact us. GOLDEN Heavy body BB (full range)/ BA & M (88 colours) (we stock the 59ml tubes and a few 237ml jars… happy to order them for you though). Heavy body is the most traditional one, probably comparable to most other brands (except for the quality of the paint which is so much more highly pigmented and a delight to apply!). The range of colours is the largest existing (145) and nothing interferes with the pure pigments in their 100% emulsion binder: no fillers, extenders, matting agents toners or driers. GOLDEN Fluid BB/BA/M (we stock the 30ml and 118ml bottles… there are larger ones… but not in all colours) Fluids are fun! You can drop, pour, stain, mix like a dream with the heaviest paste and they keep their amazing intensity as they are as highly pigmented as the heavy body. These you can read as much a you want about them, you might have to try them! They come in 84 colours (to date) among which a great range of iridescent and interference colours… particularly well adapted to a fluid application. GOLDEN High Flow BB/BA/M (we stock the 30ml and the 118ml bottles). These are more like ink than a paint, as they flow effortlessly from a brush (great for little details) but of course can also simply be poured for staining or used as a wash. They can be used as is in an airbrush and you can fill markers and other technical pens with them too. (We stock some empty markers just for that purpose here too.) They come in 49 colours, including some iridescents and fluorescents. Maybe a third of the range are transparent colours (sometimes existing in both transparent and not) which presumably would be the best ones for washes. GOLDEN Open… BB/BA/M (we stock the tubs in whites only and the 59ml tubes in both shops… in virtually all colours) Open acrylic is a new animal in the range and… truly feels like nothing else. “Open” refers to the time these paints can stay workable (a couple of days on the canvas, a week or more if well protected on your palette). What that implies is both a lot less paint wasted and a lot more time to play with it… so much so that you might revert to more traditional techniques once only possible with oils! Again you might have to try them to see if they work for you. They come in a more limited range of 80 colours and have 4 specific mediums and a thinner. Jacquard’s Lumiere BB/BA/M light body metallic acrylics in 70ml jars. Lumiere is a rang of 32 brilliant metallic and pearlescent colours… we already liked them as pigments but now they are ready-made! They brush easily and are bleed resistant which makes them ideal to paint on other already painted or interesting surfaces (be it wood, leather, textile or paper or canvas). They are highly pigmented and air dry in about 24hours. If you use them as fabric paint they must be then heat-set by ironing to make fabrics washable and even dry-cleanable. 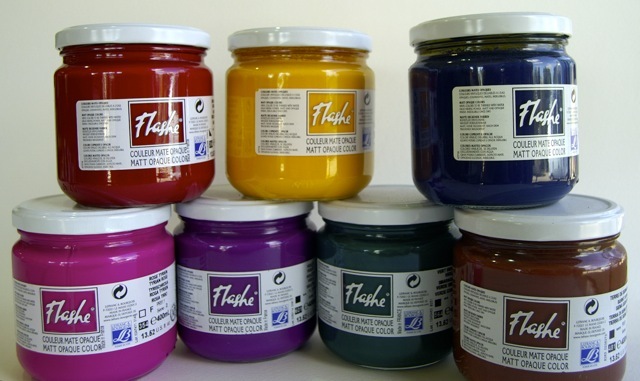 Lefranc Bourgeois’ Flashe: in 125ml BB/BA/M (400ml jars are being discontinued) in 62 colours (including 7 fluros!!). These “acrylic” paints are in fact extra-fine vinyl-based paints and I love them! They could be an amazing gouache and are often compared to a tempera like paint as they dry to a yummy matte finish which is both intense in colour and depth. They are highly pigmented and come in a range of truly… Flash colours! Apparently, their high adherence to uneven surfaces and being vinyl paints makes them adequate for outdoor painting of walls, furniture etc. I think they look amazing on canvas and they can be mixed of course with all your acrylic paints. MATISSE was our choice of a good Australian brand. 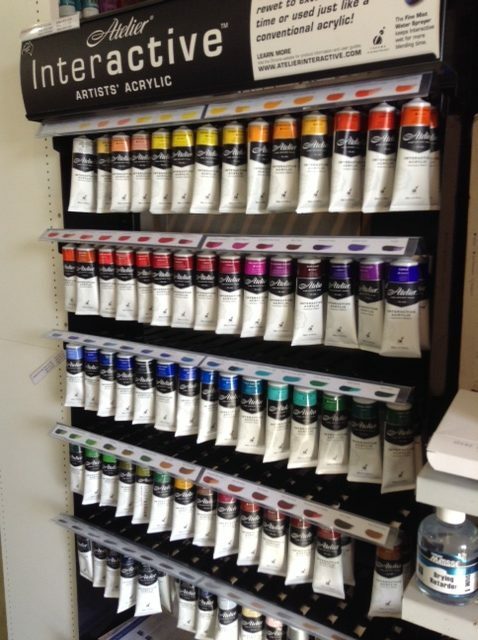 They also have a Flow formula but we only stock the Structure one, a rich impasto artist paint. Only quality pigments and ingredients are selected for the range which rate ASTM 1 or 2 for lightfastness. We stock in Byron the 3 sizes of their 96 colours range among which some uniquely Australian colours and in Ballina and Mullumbimby the full range of 75ml tubes + a few colours in 250/500ml. We also stock their sets: Intro, Primary, Australian Colours, Seascape, Landscape, Portrait… and I DO like their new flip-top cap!